Affordable Accoutrements: Blue and Gold in a Flash! 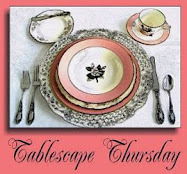 It's time for another Tablescape Thursday with Susan of Between Naps on the Porch! I was NOT ready for the party this week, but I wanted to participate. So ... here's what happens when I get home from work on Wednesday after 5 and start the process of creating a table post from scratch. Well, I actually set two tables ... you'll see. Partly because I was in a hurry and partly because the salad plates I'm using inspired me to aim for a quiet simplicity, the settings aren't elaborate -- just a dinner plate, salad plate, cloth napkins, and one glass per place setting. Instead of a floral centerpiece, I used single fern fronds in julep cups (silverplated goblets on the smaller table) and tealight candles in glass holders down the center of the table. The salad plates are English, Booths Real Old Willow. I particularly like the scalloped edges and gold rims. I think it sets them apart from other blue willow patterns. These are from a recent estate sale. The pattern was introduced in 1906, but the backstamp indicates that these were produced between 1944 and 1981. When the Booths factory closed in 1981, Royal Doulton decided to continue production of Real Old Willow, with their own backstamp, adding the words "The Majestic Collection." 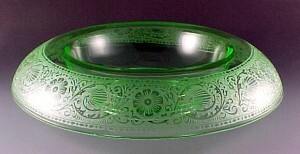 This Willow/Majestic range was produced on a translucent china body, rather then the opaque silicon china one. It was in production from 1982 until 1999. The cobalt blue stemmed glasses are from three different thrift stores (99 cents or less per glass). I don't know the pattern, and Replacements.com lists them as "unknown." Do you know the manufacturer? Sometimes simplicity is the best approach (especially when you're playing beat the clock!). I've used the mid-century 1847 Rogers Bros. flatware in past tablescape posts. The clean lines seemed appropriate for these tables. The dinner plates are Concorde by Haviland. I brought in a glass topped outdoor table (quick clean up and an old sheet underneath to protect the rug) and covered it with a thrift shop bedspread. The wicker chairs are from the sunroom. Candles always help set the mood. Perhaps I'll leave the table set and host an impromptu dinner party (and maybe I'll wash the salad plates and put them back on the table -- they came straight out of the box from the sale). The tealight holders are from a different estate sale -- a whole box of them for a dollar or two. That's it ... time to join the party. The blue plates are beautiful! I can't believe you just threw that together. You have some mad skills! Could you add that flatware to my list on the will! You are amazing, Bill...it is hard to believe you threw these tables together in no time at all...beautiful...I love the salad plates, have never seen Blue Willow with a gold-rimmed scalloped edge. I love that green room! Your "quiet simplicity" is still beautifully elegant. I have a cup and saucer to match your dishes--one of a kind for me. Got from behind "the glass case" at Good Will! 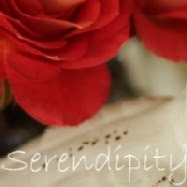 Your blog is always fun to visit! I love the simple ferns and the candles placed down the center -The big table set in the dining room and the smaller table set in the other room sure brings back wonderful memories of the "adult" table and the "kids" table. Thanks for sharing such a simplistic table -I love reading the history of your treasures. This is just not fair Bill!! Only you could come up with this at the last minute! I love this look, and the ferns are a brilliant touch. That I will try! I love this table!! I did a last minute "table", too. My, do we live in different worlds! I just love your Blue Willow and the tea lights are gorgeous and fun. The "Big" Table is so elegant and the glass top table is so fun. I would love to come to your salad supper and I will even help wash the dishes. And you did all that with one hand tied behind your back and your eyes closed didn't you? I actually LOVE the simplicity of it. I *think* you left those dinner plates to me in your will last week. Therefore, "my" plates showcase the Blue Willow beautifully. I loved seeing the beautiful wood tones of the table. The blue plates are so pretty and the simplicity of the entire table is quite stunning. Beautiful, Bill! I love the elegant simplicity. Your home is gorgeous, too. It looks to me like you are perfectly ready to host a dinner party. I hope the guest will bring you potluck and save you the trouble. I always enjoy your fancy tables, but this one is just as nice. Thanks for sharing. Love your scalloped edge Blue Willow~ and the simplicity of your fern fronds in the mint julep cups is so elegant! Bill, I can't believe you came in from work and just "threw" those beautiful tables together! I absolutely love those gorgeous salad plates and your stemware. I would love to be able to find some estate sales that had such wonderful things. About all I can find in Eastern NC are plastic deck chairs and Corelle! Yuck! Thanks for another visual treat for your followers. I even loved the bedspread masquerading as a tablecloth. So simple yet so beautiful. This way there is room for the food. Tell me there is food. Your "simple" is simply elegant!! Beautiful tables, as always!! A wonderful and quiet table! I am so in love with those tea light holders! They make such a wonderful statement. I like how you used ferns and cups to make a centerpiece! Beautiful as always. There is not one thing that makes me think that you were rushed. It is lovely. I just love to come visit! I could tell from the teaser pic on BNOP that those were the real old willow. They are just gorgeous. Once again, beautiful.. I am in love with the tea light holders. You really have a very elegant ambiance in your dining room that everytime I visit you, it makes me drool & wish & dream that this is mine. Whatelse a guest can ask for? This is just perfect. Fab dishes & fab host. the new wall color is just great for fall decorations. I love the salad plates for their gold rim. Gives a very elegant touch. And I love the stemware for the blue stem. Much nicer than a blue bowl because one can see the wine in the glass. As usual very pretty tablescape. Beautiful color, I love the single ferns too, very elegant! I absolutely love the simplicity of these beautiful tables, Bill. Breathtaking! One of my favorites, Bill. I love the simplicity. What a beautiful duo of tablescapes...the plates seem made for each other...kudos!!! If you could bottle and sell that creative energy, you would rule the world! I am still loving your new wall color in the sitting room. You did this on a Wednesday evening at 5:00?? O.k. you are making me sick, but in a good way! HA HA! Your table looks like it would have taken me forever to get this together. It is beautiful! I need to find some good sales like you do! I also want to say that I LOVE your new wall color and of course the sofa is perfect for the setting room. You did a wonderful job painting. It is a lovely change and I hope you enjoy it! Green is always a great color. Now that 's the way to tablescape-throwing a few things together to make it look like you worked for hours! I can't use "I'm busy this week" as an excuse any more, I've got to get back to my dishes. Great post Bill!!! I love that you got some of your beautiful things from estate sales and thrift stores. I never would have guessed. Both tables are simple but very elegant! Beautiful, and thanks for letting us in on the how-to part. Beeeautiful,..the mint julep cups,just the right touch too. My mother always told me, "Simplicity is the key to elegance". I can still hear her saying it in my head. Your tablesetting certainly holds true to my mothers words. Absolutely stunning. Those salad plates are gorgeous but I really liked the glass tea light holders. I have GOT to start going to more estate sales. Thank you for sharing all your ideas. You are an inspiration. they are beautiful, you can't tell that you put them together quickly. The china is beautiful with the scallop edges. Very nice lighting and the windows look incredible too. I just love your pictures, always. Bill, Your table looks elegant! I really love your Blue Willow. The stemware sets if off perfectly. Gorgeous tables, Bill! Your table settings are always lovely...always inspiring. Thank you for taking the time to share. Bill, your simple tablescape looks very elegant to me. I had never seen any Booth's Old Blue Willow before and now it is on my list of look out for dishes. Where does this long list ever end? LOL Really, they put the reqular Blue Willow like I have to shame. Have a fun weekend. Hi, Bill. Everything looks gorgeous, as always. I can't believe you have so many mint julep cups -- oh, how I love silver mint julep cups! Lovely, beautiful, classic table. And your other set up with the wicker chairs looks fabulous! So elegant, yet comfy and casual. What can I say? You are the Master!! I love the stemware. I don't have blue stemware and most of what I see is too blue...you know? Yours is perfect with those beautiful plates. I think you did a very lovely table(s). You shouldn't have told us you did it last minute, we would never have guessed it! You even do simple in such an elegant way. I love your julep cups. Everything is so beautiful. Those salad plates are so nice, what a great find along with those votives. The fern in the julep cups puts a perfect bit of green on the table. And I must comment again on that beautiful green paint. It looks so fresh. You have such a wonderful talent! Love your ROSE camelback sofa & newly painted walls! Gorgeous! Echoing the sentiments above...your tablescaping is a sight to behold! Even with your late start, you managed to set TWO beautiful tables?? Impressive! I always enjoy your educational tidbits, so keep 'em coming. Love the fern fronds in julep cups! What can you say, lovely as always. Bill, I hope wherever you work you use your God given talent for seeing and making things beautiful. Have a great weekend! A very simple, elegant table! I love the scalloped edges of the plates and your pretty votives. You have a wonderful talent, Bill. Thank you for sharing. Bill,Thank you for your sweet comment and for visiting LazyonLoblolly on the top porch. Gee Bill -- even in a hurry your tables are stunning! Thanks for telling me about my sherbet stems - I didn't know the pattern. I always appreciate your visits to my table. Beautiful, Bill. I would be happy to dine there! Amazing you found those blue stems in different shops! When I was a little girl I read a book from the library - "Blue Willow." I have liked that china since! I told my friend about it and she found a "Blue Willow" book for me! It's not the old one, but I love it! Both tables are very pretty! I really like the new paint job too, I just read the post on it. Did you see my last tablescape? It's one of my favorite, I would like you to see it when you have time! Thanks! Perhaps my favorite part of your tablescape was the ferns in the silver mint julep cups! The simplicity of them was so sophisticated with the classic blue willow dinnerware. Very enjoyable. Sorry a bit late leaving a comment but you know why!! I love all the simplicity of the tables, I would feel very happy to sit at both tables. I love willow plates and the romantic fable of the legend behind the pattern.The single fern frond is very artistic and Ikebana style. I am off to catch up with your other post I missed!! Have a great weekend, Jackie, Surrey,UK. P.S. Your comment on my blog made me giggle. I really like the scalloped edges of your beautiful china. Those tealight holders are gorgeous. I don't think I ever noticed the detail in the corner of your dining table ~ very pretty. I bought a nice white bed covering earlier this year only to use on my kitchen table, but it did not fit right, so I took it back. Floor length wouldn't work in my kitchen, but I love the look of yours as floor length table covering. Oh I really like those lovely blue plates. You have exquisite taste. Now, what time shall we eat? Hugs! Loved this simple yet elegant table setting. So lovely, and so inviting. Your dining room is so pretty. Liked the smaller table as well, I have that same white spread and love it. Looks wonderful as a table cover I must say. The stemware is just beautiful and goes with those wonderful blue salad plates so well. Also Loved the touch of the ferns at each place setting as well. I love those blue and white dishes, too. I have three different sets of blue and white dishes, along with bits of pieces of many, many more blue and white patterns.